This Point Loma swimming pool customer was wanting to replace his pool equipment. When performing our free pool equipment estimate, we decided he did not need a new pool heater. We wrote and sent them a estimate to replace the filter, pumps and install a new salt water chlorinator. When providing information about new pool equipment, we recommend the best equipment for each specific installation. So Pentair pool pump, Pentair jet pump, Pentair pool filter and a Jandy TruClear salt water chlorine system. Below we will explain more about this specific Point Loma pool equipment installation. 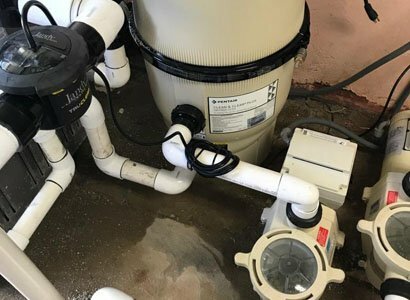 This Point Loma pool pump install consisted of a Pentair variable speed pump and a WhisperFlo jet pump. 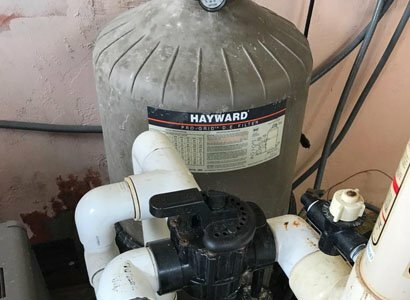 The old pool pumps were Hayward NorthStar pumps that were leaking and noisy. 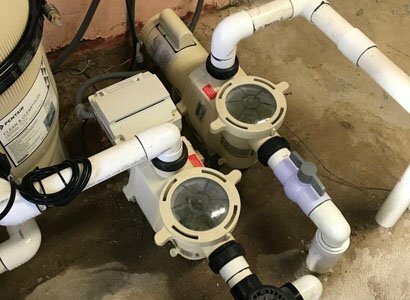 When it comes to recommending the best pool pumps, we always lean towards Pentair. Not Always is this the case based on customers needs and request though if possible we use Pentair. We know the Pentair IntelliFlo VST 2 works great and we have had very few issues. And the Pentair WhisperFlo jet pump or booster pump is the best option. We know there are a lot of pool filters though we prefer the Pentair Clean And Clear Plus cartridge filter. We do not typically install a D.E. pool filter unless it is requested by the customer. That is because the Pentair Clean and Clear cartridge filters clean just as well and go longer between pool filter cleanings. They also seem to last longer and go longer before the need of a pool filter repair. D.E pool filters are also very messy when cleaning and a harder filter to clean. This Point Loma salt system installation was with the Jandy TruClear salt water system. This salt water controller is a cost effective, high quality salt water system that works great and saves money. The salt system has a user friendly display on the power center and has a very cost effective salt cell replacement. With salt system installations, it depends on a few variables. Customer preference is a big one though it also depends on if you have pool automation. Certain pool automation requires a salt system that is compatible with the pool controller. 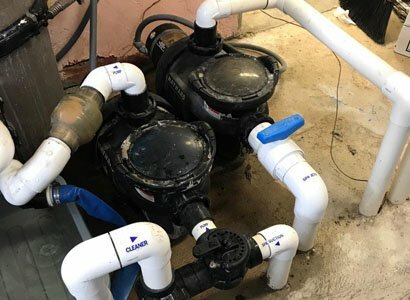 With this specific Point Loma pool equipment installation, we also installed new check valves. Check valves are used to stop the flow of water from reversing back through the pool plumbing. One check valve was for the spa bypass and the other for the flow back through the pool heater. We are Point Loma pool repair specialists along with all of San Diego County. We provide complete pool equipment installation throughout San Diego County. If you are in need of replacing your pool equipment or make any necessary pool repairs, we can help.